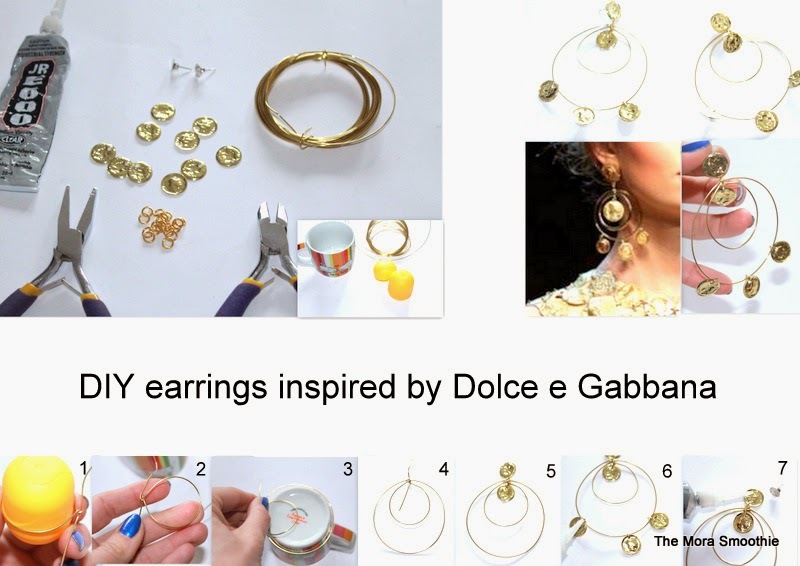 The Mora Smoothie fashion blog, DIY fashion by Paola Buonacara: DIY earrings inspired by Dolce & Gabbana! Ready for the first Spring weekend? What about to create with these amazing earrings inspired by Dolce & Gabbana to celebrate it? Time required: 15 minutes per earring. Essential: coins (I used one of those belt odalisque from here), golden thread, glue, circles, hooks for earrings, wire cutters and pliers, and tutors. Tutorial: With the help of a plastic box (I used the one of chocolate eggs) I created the first circle, then I used a cup for the second, I put the two coins and then with the circles I applied the three coins on the bigger circle and I got a bit of glue to stopped. Finally, with a bit of glue, I applied the hook for earrings. Pronti per il primo fine settimana di primavera? Che ne dite di creare con me questi bellissimi orecchini ispirati a Dolce e Gabbana per festeggiarla? Tempo necessario: 15 min per orecchino. Necessario: monetine (io ho usato quelle di una cintura da odalisca avanzatemi di qui), filo oro, colla, cerchietti, ganci per orecchini, tronchesi e pinze, e dei tutor. Tutorial: Con l'aiuto di un contenitore (ho usato quello degli ovetti Kinder) ho creato il primo cerchio, poi ho usato una tazzina per il secondo, ho inserito le due monete e poi con i cerchietti ho applicato le tre monete sul cerchio più grande ed ho messo un pò di colla per bloccarle. Infine con un pò di colla ho applicato il gancio per orecchini. Top quality from different direct resources that are Kodi Addons 2017 enjoying game-play more peaceful than playing the video. One of the first locations to move whilst looking for free Music Videos DVD to observe, but now not always to download, is the artist's internet site. Again, these are remarkable marketing equipment, so artists will frequently publish them to assist promote their albums.